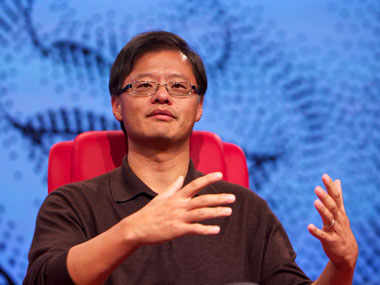 When Yahoo co-founder Jerry Yang last appeared on the D stage back in 2008, the Internet giant was in tumult. Tapped as successor to former CEO Terry Semel and the man who would finally turn Yahoo’s fundamental strengths into healthy financial performance, Yang was already having a tough time of it. Yahoo continued to struggle and Yang’s tenure as CEO had already been threatened with an unsolicited takeover bid by Microsoft. In November of that year, he stepped down as CEO, to be succeeded a few months later by former Autodesk CEO Carol Bartz — who would have a longer, but similarly troubled tenure leading the company until her ouster in September of 2011. Doggedly committed to the company he co-founded, Yang joins us today as a Yahoo director — ironically, one facing many of the same obstacles that confronted him back in 2008. One bright light amid the darkness: Yahoo’s massive and successful business interests Asia, currently overseen by Senior VP Rose Tsou, who joins Yang on the D stage today. 7:57 am: Good morning from Hong Kong. Yahoo’s Jerry Yang and Rose Tsou will be on stage shortly. In the meantime, I can report that we’re playing Stray Cats in the ballroom here at the Grand Hyatt. And now, some Devo. Perhaps at some point we’ll move to non-80s music. And if so, I’ll advise. The Devo’s pretty good, though. If you want to play at home, enjoy. Walt delivers an update on Kara. She’s doing just fine, as you can tell if you follow her Twitter account. Walt talks about Jobs agreeing to come to the first D conference, and four more following. The last year, “he looked extremely frail — I think a lot of people were concerned.” And then he spoke with great vigor for an hour and a half. 8:08 am: And now, Jerry Yang and Rose Tsou. Some discussion of Kara’s health and great affection for writing about Yahoo. Walt notes that Kara filed a couple Yahoo stories while en route to the hospital Wednesday. 8:10 am: Walt: Tell us about the status of the CEO search. Looking at all the options, both for Yahoo, and a prospective CEO. 8:12 am: Walt: How do you look for a CEO while you’re putting yourself up for sale? 8:13 am: So what are some of the real options: A sale, and what else? And we have investments with Softbank in Yahoo Japan, and here in China with Alibaba. Very valuable. 8:14 am: Walt: That’s the most important asset, according to Wall Street. Jerry: Yes, there are plenty of options. Walt: But you need to decide what you are. Last time you were here in 2008, I asked you and Sue Decker “what is Yahoo”? And to be honest, you guys had a lot of answers, but not a crisp answer, like Steve Ballmer or Steve Jobs or Larry Page would have. Jerry: You can watch videos, for instance, we’ve also got news, finance, sports, entertainment. “We’re probably category leaders across the spectrum, in different regions.” Yahoo Mail is big. Walt: But hasn’t Yahoo Mail gone down? Jerry: Yes, people think Yahoo Mail is declining, but the number of messages is up, engagement is up. Web-based mail is being replaced by mobile and other devices. But the fundamental back-end proposition that we offer is stronger than ever. 8:18 am: Rose: People come for Yahoo news, or finance, and they discover other stuff, like videos. A couple of weeks ago, we launched a premium video consumption site in the U.S. In India, where there’s low-bandwidth access, video and entertainment are very big for us. Providers want to be on our platform, because of our reach, all over the world. 8:20 am: Walt: Jerry, do you have all the Hollywood and big media deals you need to make this happen? Jerry: If you look at the media part, we’ve evolved from being a pure aggregation play to “having a voice.” We’re creating “color” around other people’s stuff, and we’re making our own. Like last week, when we were the exclusive streamer for the Bill Clinton concert. 8:21 am: Walt: Do you need to move more into video, etc.? Sports is big for you but you can’t watch sports on Yahoo. Jerry: At the end of the day, if you look at what Yahoo’s been for past 15, 16 years, the part we have to sharpen is distributing content for our partners. Outside the U.S., we’ll definitely be distributing TV. In the U.S., less of that, but note our (most recent) partnership with ABC News. In Silicon Valley there’s one view. But the reality is Yahoo is doing lots of those things. 8:23 am: Walt: Back to the review. What’s the best outcome. Would it be best if Jack Ma bought the whole thing? Jerry: You’d have to ask him. I think that’s what the board and management are trying to do. Walt: So can an entrepreneur like Jack make that happen? Jerry: We’re looking at everything. Walt: Do you want to be in the hands of a PE company? Jerry: I don’t know, Walt. I think all of the options will work themselves out. 8:25 am: Walt: OK. The Microsoft deal, where at one point they were going to buy you, and then it became a search deal. It seems like it hasn’t caught fire and done as much for you as you’d hoped. Walt: Meanwhile other people keep nudging into search. Even Apple’s Siri can represent search. Jerry: Our focus is simple. We can control the way our users conduct a search. We’ve gotten very good at that. Microsoft is responsible for the back end, and for monetization. And the core focus is monetization. So there will be innovation about the way you find search, and define search, but really the core focus is on monetization, and we can’t help Microsoft much with that. 8:29 am: Walt: Rose, let’s talk about Asia. How important is Asia to Yahoo and consumers as a whole? Rose: Very important! And growing! Between southeast Asia and India, in the next three years, there will be 100 million users coming online. Walt: Primarily through mobile, right? Rose: Yep. And not the smartphone we’re used to, but the $50 feature phone. Walt: But as you know, smartphones will get even cheaper. Rose: Yes, and a $100 feature phone now functions much like a smartphone. Walt: So are you building features for that market segment? Rose: Absolutely. For starters, we have to make sure media and communication products render well on those phones. And then we have to work on discoverability. People have to find your services. So we do a lot of partnership deals with chipset deals, and handset manufacturers, for instance. Walt: How does a chipset deal help media discovery? Rose: Great question. For example, we did a deal with a chip company so the media discoverability is sort of baked into the middleware. So when they pass on the chips to handset makers, it’s that much easier. In the feature phone market, lots of local makers are very happy to have brands like Yahoo baked onto the chipset market. We’ve gotten great feedback from manufacturers in India, Indonesia, China. 8:34 am: Walt: Jerry, there was a good story in the Asian WSJ the other day, tied to Steve Jobs’s death. It wanted to know about the Steve Jobs of China, and whether China was able to harness the energy and wonderful companies and services you have here, “but a lot of it is considered derivative” — they iterate on ideas that originate in the U.S. or elsewhere. Jerry, “what’s the deal there?” Do you think that’s right? When will China “startle the U.S.” by thinking up its own stuff? Walt: I know. But he did lots of great world-changing things, and it’d be nice if a Chinese entreprenuer did one. 8:37 am: Jerry: “This is a statistics and probability question.” The number of people with technical training, and a Western education and understanding of how platforms work, and experience. Even compared to 10 years ago, management has so much more experience. Still, there are challenges. “This is not a foregone conclusion.” There’s a question about how does media censorship affect creativity and entrepreneurial spirit. We don’t know yet. 8:39 am: Walt: I’m sure you remember that 20 years ago, it seemed like Japan was going to surpass the U.S., and there was a lot of government organization around that. But it didn’t happen. Jerry: Please understand. “I’m not saying that China is going to overtake the U.S.” — there’s still a tremendous amount of advantage that Silicon Valley, or New York, or whatever, has with entrepreneurial culture, etc. 8:40 am: Rose: It’s harder to do breakthrough stuff here because the market is really big, and the competition is really fierce. “So I think there is less risk-taking, in going about doing something that’s never been proven elsewhere.” It’s more natural to see what works somewhere else, and replicate that. Walt: Like those fake Apple stores they have in China. Rose: Yep. On the other hand, the speed of iteration they have here is amazing. So they take a concept from the West, but they move so fast, that soon it’s a different thing. Q: As you look at what Yahoo could be, what are the one or two key areas that it could go after to truly transform itself? Jerry: We’re really focused on trying to “turn Yahoo inside out.” We do a huge amount of services internally: Data, content, personalization. Lots of other people on the Web around the world could use that. Also, there are going to be multiple platforms: iOS, Android, maybe Microsoft. And we have to be able to play on all of them. And that’s an opportunity for people like us, who can distribute a large amount of content and services. But this “inside out” idea is a big one. 8:45 am: Q: (via Eric Jackson): Your media answer reminds me of your vision 10 years ago, with Terry Semel, and Lloyd Braun, etc., that you backed down from. What did you learn then and how is that affecting what you’re doing now? Jerry: The realization is “that we have to continue to disrupt ourselves in terms of how we distribute.” So just publishing on Web pages and HTML, and don’t pay attention to apps, and mobile, and social media, and we’re not being disruptive, then that won’t work. People think that media means you have to stream or pipe data. But it can be more than that. Ten years ago, we didn’t really focus on that disruptive element — “we just tried to put TV on the Internet.” And some of that worked, but some of that didn’t. Now, off to a demo from digital camera-maker Lytro.